Selma, Ava DuVernay's Martin Luther King, Jr. biopic, follows Dr. King through the 54-mile Selma to Montgomery marches that helped lead to the Voting Rights Act of 1965. The events in the film transpired fifty years ago, but the topicality feels almost eerie, with demonstrations against police brutality taking place all over the country and the recent gutting of the Voting Rights Act, which is considered to be "the single most effective piece of civil rights legislation ever passed by Congress." So much of Selma is profoundly affecting, but particularly striking was the violence in the film. I, like so many of us, have become accustomed to the violence I see onscreen. Watching someone be shot or a building explode doesn't elicit much of a response for me anymore. It's not that gun violence feels foreign, but we're confronted by it so often that, unfortunately, I associate it with a sick feeling of normalcy. But the violence in Selma is a different breed. Most of it involves white police officers beating nonviolent black demonstrators. The nature of the violence coupled with DuVernay's beautiful direction makes it feel close, intimate, carnal. The first attempt to march on Selma was dubbed "Bloody Sunday," after state and local police (as well as white onlookers) viciously attacked 600 marchers. I can say with complete certainty that DuVernay's depiction of this event was the most upsetting thing I have ever seen in a film. Perhaps it's the tension and anger and fear that I've been carrying since Mike Brown was shot in August. It might have. And as much as I've turned these events over intellectually, I've only ever seen grainy pictures and camera footage. Whatever it was about this particular illustration—whether or not it was that the events felt current—watching them hurt. Watching a group of black people get bludgeoned like animals in high-definition with billy clubs and whips by maniacal white police officers simply because they wanted to cross a bridge was too much for me to bear. My reaction might have also been fueled by the thought of how easily this could have been me if I had been alive in 1965. This could have been my grandmother or my aunts and uncles—all of whom are alive today. The history is so close. And the "Bloody Sunday" scene and the residual feelings stayed with me for days after I saw Selma. Talking about the film with others, I couldn't shake my thoughts about seeing violence like this onscreen. When Saving Private Ryan was released in 1998, there were reports of World War II veterans walking out of screenings because the realism of the film caused them to relive painful memories. I don't doubt that Selma could elicit similar responses for those who marched and were subjected to violence during the Civil Rights Movement. 2013's 12 Years A Slave was another film that vividly portrayed the inhumanity and violence committed against black people in America. There are multiple scenes where slaves are savagely whipped, with close-ups of their broken, bloody flesh. At the time, that violence didn't particularly upset me—perhaps because I felt more removed from it—but also because I was strangely able to justify it. Director Steve McQueen had a story to tell and that violence is an integral part of the story. Furthermore, if (white) people are to understand the depth of the atrocities that were committed against black people in this country, graphic, unsettling violence is certainly a way to do that. I doubt that this was McQueen's goal when making the film, and it certainly doesn't need to be the goal of any film, but nevertheless I had to ask myself: Is this helping? After watching this film, will Americans better understand the scope and depth of the damage that was caused by slavery? Will they fully grasp the painful history of our nation and the modern-day ramifications? A year after the release of 12 Years A Slave, I'm not convinced that it had the impact I was hoping for. One could argue that the larger American population wasn't exactly lining up to see the film. Still, it won the Academy Award for Best Picture, Best Director and Best Adapted Screenplay. That still counts for something in our cultural landscape, I told myself. Selma, however, has helped me to clarify how I approach such films. With all the recent co-opting of Martin Luther King, Jr.'s memory and the downright twisting of his words, Selma reminded me that he was working for black Americans first and absolutely foremost. While he felt compassion for all those who suffered and he embraced anyone willing to help the cause, Dr. King was always clear that we were his people. We were who he was fighting for. So I've moved beyond this idea of films like Selma being opportunities or tools to elicit compassion from white people or to help the uniformed understand the dark history of this country and how they are tied to it whether they like it or not. Frankly, I don't care anymore. 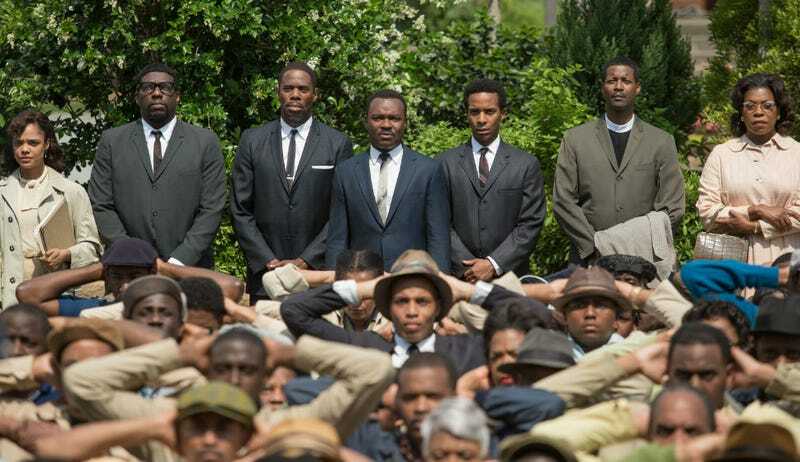 The question that I now ask myself about Selma is: How does this story speak to me? How does this help other black Americans and any other group of people who have been faced with injustice and violence in this country? I know my history. I knew about the Selma marches. But I walked away from the film not with more respect for those who marched, but with a different kind of respect, rooted in deeper feelings of understanding and solidarity. Even more than that, Selma angered me. It helped me to remember that people don't just get over being treated like that, nor do they have to. We should allow ourselves to feel whatever anger and hurt that remains as well as that which is stirred every time we hear of another Eric Garner or Tamir Rice. Remembering pain is not the same as wallowing in it. I cannot speak for Ava DuVernay, but as I see it, Selma is not meant to awaken the apathetic, but to reignite and fan the flames for those of us know too well how much work and healing we still have in front of us.